10 to 20% of all homes are covered in "hot spots" of electromagnetic fields over 2 milligauss. With the CellSensor, one can walk the house and in 5 minutes find these hot spots that measure over 2 and avoid placing beds and furniture there. 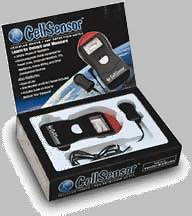 Simple to use, the Cell Sensor meter shows the hot spots with needle, light and sound! The meter is normally quiet...showing 0 reading. When you walk by a hot spot, the needle goes up over 2, the light glows, the sound beeps! Without the meter, it is impossible to know where the hot spots are! A hot spot could be created by sleeping with a TV on the other side of the wall, or by faulty wiring, typical after renovation projects, or by proximity to visible or hidden underground powerlines! While the reason for the creation of hot spots can be simple or complex, avoiding the hot spots is always very simple. Most hot spots are small, so moving a bed or furniture just a couple of feet usually does the trick! Most hot spots are dealt with that way, just avoid placing furniture there by moving it a little bit! Simply plug the included probe into the meter, turn it on, place the setting on H for high sensitivity, and the meter needle now is reading 0 to 5 in its display. Readings over 2 are high. Those are the hot spots to avoid. In this same way the meter shows safe distances from appliances such as TVs and microwaves! Since 10 to 20% of all homes have hot spots, it is important to spend 5 minutes checking the home! It is simple and one gets a great feeling of accomplishment when one move's a child's pillow away from a hot spot! The World's First Meter to Address the Health Issues Associated with the Cellular Phone and EMF Power Line Controversies. Includes Exterior Probe for ease of measurement of ELF fields (extremely low frequency magnetic fields). Also measures Electromagnetic Fields generated by Power Lines, Computer Monitors, TVs, Appliances, Home Wiring, and Other Unsuspected Sources. Light signal glows when you walk by a "hot spot"